Saskia Beudel uses one of the artworks of exhibition Try This At Home, an installation by Slow Art Collective as a catalyst to explore the lives and histories of discarded objects. 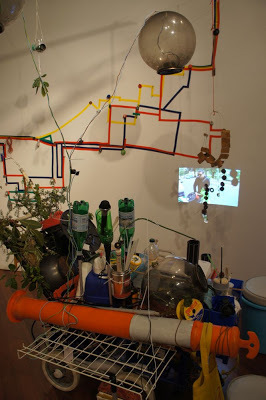 As Try This At Home curator Margaret Farmer describes, the Slow Art Collective (Tony Adams, Chaco Kato and Dylan Martorell) use abandoned objects left by local residents for council pick-up to present an installation made from household refuse and repurposed discarded items. During an artists’ talk held at Object in early October 2011, members of Slow Art Collective commented that the alleyways and laneways along their chosen foraging route were almost disappointingly clean. Pickings were lean. These bare laneways suggest the efficacy of council pick-ups, or perhaps, more utopically, social habits less inclined towards designating particular items as ‘waste’. There’s an irony here, of course, that with less waste on the streets aesthetic possibilities diminish.